The 2018 Honda Clarity is uniquely available in Plug-in Hybrid, Electric and hydrogen-powered Fuel Cell versions. We describe each. The 2018 Honda Clarity PHEV is the plug-in hybrid version of Honda's new green-car lineup. And it's available throughout the United States. 2017 Honda Clarity vs. 2017 Toyota Mirai: Which Is Better? If you're considering a hydrogen fuel cell car, you have but two choices: the 2017 Honda Clarity and 2017 Toyota Mirai. Which is better? There are three versions of the 2019 Honda Clarity, but there's really only one that's relevant: the Clarity Plug-in Hybrid. It's also one of the most appealing in its rapidly expanding segment of vehicles that blend emissions-free electric driving with range-anxiety-free hybrid driving. Not only does it have more electric range than everything except the soon-to-be-discontinued Chevrolet Volt, but it's generally nicer to drive and has a richer, quieter cabin than others in the segment. Its price tag isn't even that outrageous and it gets better when you consider hefty rebates. Now, for the other versions. The Clarity Fuel Cell is a well-executed hydrogen-powered car, but it's only available for lease in California … which is also the only place where you can realistically fill it with hydrogen. The Clarity Electric at least expands its lease-only availability to Oregon, but that doesn't really fix the fact that it's saddled with a rather pathetic 89 miles of range. So for most of the country (and for anyone seeking an electric car), they might as well not even exist. The Clarity family carries over unchanged for 2019, but was all-new last year. This is going to get complicated, so bear with us here. The Plug-in Hybrid operates much like a regular electric car for an ample 47 miles on electricity alone (only the Chevy Volt surpasses that among plug-in hybrids). When that's depleted, it effectively runs like an Accord Hybrid, with a gasoline engine replenishing the battery while the electric motor continues to power the wheels. Regardless of the fuel economy achieved when operating as a hybrid (42 miles per gallon combined), that ample range gives the Clarity a big-time advantage over plug-in hybrids like the Toyota Prius Prime for those who can plug in regularly. On the other hand, combined driving range is 340 miles, which is considerably less than other plug-ins because of its tiny 7-gallon gas tank. The Clarity Electric is a pure EV, but its range of 89 miles is rather pathetic given most electric cars are at least in the 110-140-mile range, while the Chevrolet Bolt, the Hyundai Kona Electric and the Kia Niro Electric top 200. The hydrogen-powered Clarity Fuel Cell is available for lease only in California, which is the only place with any semblance of a hydrogen infrastructure. It has a fuel cell that chemically combines hydrogen (H2) and oxygen (O) to create energy, the only byproduct being water. The created energy is sent through an electric motor aided by a battery pack that's replenished by the fuel cell and regenerative braking. Now, for reasons too complicated to explain here, Clarity owners basically get their hydrogen for free, so its MPGe rating of 69 miles per gallon in the city, 67 mpg on the highway and 68 mpg in combined driving is only relevant in regard to how frequently you refill, as opposed to cost. 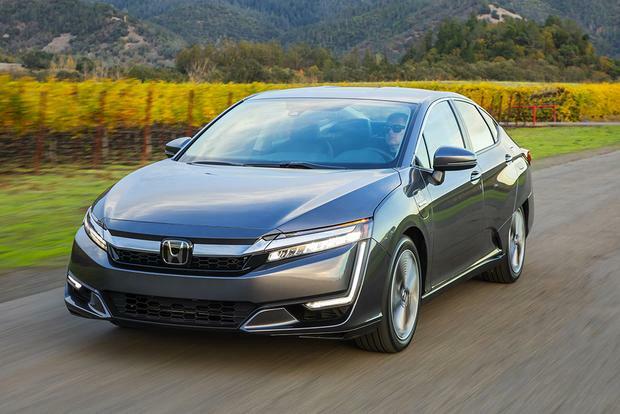 This is basically the same as the hydrogen-powered Toyota Mirai, but as the Clarity has a more powerful motor, you'll be enjoying better performance with the Honda. The 2019 Honda Clarity is available in Plug-in Hybrid, Electric and Fuel Cell versions. Each isn't available in every state, but all should be eligible for substantial tax rebates. The Clarity Plug-in Hybrid is available in two trims: base and Touring. The base model ($33,400) comes standard with 18-in alloy wheels, lane-keeping assist, forward-collision warning, Honda's LaneWatch blind spot monitoring system, a backup camera, adaptive cruise control, automatic LED headlights, proximity entry and push-button start, dual-zone automatic climate control, a height-adjustable driver's seat, cloth upholstery, heated front seats, a 60/40-split folding back seat, an 8-in touchscreen interface, Apple CarPlay, Android Auto, two USB ports, satellite radio, HD Radio and an 8-speaker sound system. The Plug-in Hybrid Touring ($36,600) adds leather upholstery, power front seats (8-way driver, 4-way passenger), a leather-wrapped steering wheel and integrated navigation. The Clarity Electric is available for lease only in California and Oregon, and in only one trim level that equals the Touring's equipment. The Fuel Cell is only available for lease in California and also shares the Touring's equipment, but you do get $15,000 worth of free hydrogen. The Clarity comes standard with stability and traction control, front side and full-length side curtain airbags, a driver-knee airbag, a backup camera, lane-keeping assist, a collision-mitigation system (forward-collision warning and automatic emergency braking) and Honda's LaneWatch blind spot monitoring system. The latter two items belong to Honda's previous generation of safety systems, however. Newer Hondas like the CR-V and the Accord have a simpler yet more effective blind-spot monitoring system in lieu of LaneWatch, while the collision-mitigation system has been enhanced with more natural brake application and fewer false alarms. The Clarity's systems are akin to those in the cheaper Civic. For those interested in the Fuel Cell, but are concerned with carrying hydrogen around in your car, the Clarity has been designed to withstand impacts to its two resilient carbon-fiber tanks. One must remember other cars drive around with extremely flammable gasoline. A back-to-back drive in the Clarity Plug-in and the Prius Prime (or most other plug-in hybrids) will reveal a car that's far more civilized. There's less road and wind noise, the engine is quieter when it kicks in, the ride is more comfortable and the cabin has superior materials and a richer vibe. It also can legitimately seat five people, unlike the Prius Prime and the Chevy Volt, making it a more viable choice for family use. Really, that the Clarity Plug-in Hybrid costs less than a Volt is a bit shocking. Cargo space differs in each version. The fact that the Plug-in has a trunk rather than a hatchback like most other plug-ins reduces versatility somewhat, but the tall trunk height and ample width make it quite functional. The rising, stage-like portion closest to the back seat reduces space, but the deep covered well in the aft portion makes up for this somewhat. The Electric's extra batteries and Fuel Cell's hydrogen tank chew up considerable cargo space, further reducing their appeal. In terms of driving experience, each of the three Clarity versions feels similar when accelerating, exhibiting the ultra-smooth and torque-rich thrust of an electric motor. The only difference is where that electricity comes from. When the Plug-in's gasoline engine does come on, it stays mostly in the background unless you really gun the accelerator, and although you do notice an increase in vibration and noise, it's far from objectionable. 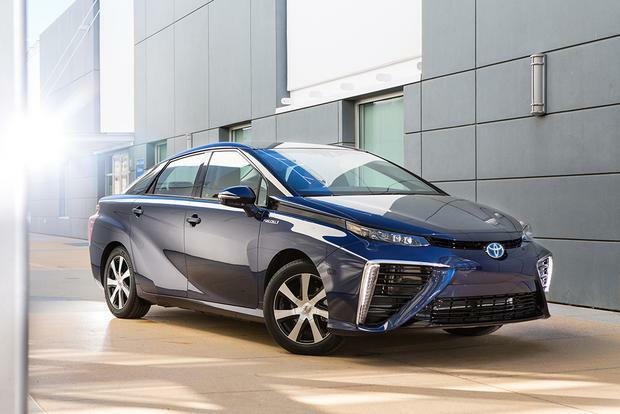 The Fuel Cell's hydrogen fuel cell is largely undetectable, lacking the whirring and whizzing of the Mirai's. One area of frustration is infotainment. The Clarity has the Civic's touchscreen, which irritates with slow responses, convoluted menus and a lack of supporting buttons and knobs. The CR-V and Accord have updated and superior infotainment interfaces, and we think the pricey Clarity should, too. 2019 Toyota Prius Prime -- The Prius Prime has basically half of the Clarity's all-electric range, but its more efficient gasoline powertrain makes it more efficient if you don't plan on frequently recharging the battery. It has a greater total range and a cheaper price, and its hatchback may be more versatile, but it has less passenger space and isn't as refined. 2019 Hyundai Ioniq -- Like the Clarity, the Ioniq is available in Plug-in Hybrid and Electric versions. Most of the above points about the Prius Prime also apply to the Ioniq Plug-in. Ditto the Ioniq Electric, but it can go considerably farther on an electric charge than the Clarity. 2019 Kia Niro Electric -- The Niro Electric, along with the Hyundai Kona Electric, are the latest EVs that top 200 miles of range. The Chevrolet Bolt and various Teslas are the others. All are worth a look if you're planning to go electric. 2019 Toyota Mirai -- Considering the Clarity Fuel Cell? Well, this is literally its only competitor. Read more about how the Clarity and Mirai compare. The Electric has such poor range and the Fuel Cell such limited availability, they might as well not exist. That leaves the Plug-in Hybrid, which is not just the only relevant Clarity, but a pretty compelling plug-in hybrid as well. Deciding between its trim levels really comes down to whether you want power seats and leather.